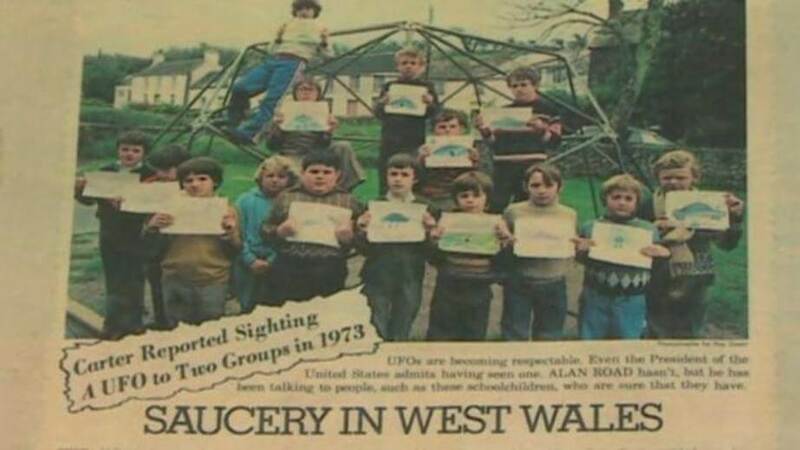 There were no alien invasions or tales of abduction, yet a UFO sighting by a group of Pembrokeshire school children remains one of the most famous cases in Wales. It was 40 years ago when a class of pupils at Broad Haven Primary School said they spotted a UFO in a field near their playground. It was one of a wave of sightings in the area in 1977 – dubbed the Dyfed Triangle. David Davies was 10 at the time and heard reports of pupils seeing flying saucers throughout the day. “I was a natural born sceptic so after the bell rang I decided to go to the area that the children said they had seen it,” he told BBC Wales. He described seeing a silver “cigar-shaped” craft with a “dome covering the middle third”. Mr Davies said he did not feel afraid, “more in awe and wonderment”, although he admitted he had “a strange desire to run away”. None of the teachers believed the children and so the headmaster separated them and got them to draw what they saw. There were slight variations, but what they drew was basically the same. Two months later, Rosa Granville, who ran the Haven Fort Hotel in nearby Little Haven, described seeing an object which looked like an “upside-down saucer” and two “faceless humanoid” creatures with pointed heads. She said so much heat came off it, her “face felt burned”. “There was light coming from it and flames of all colours. Then [the creatures] came out of these flames, that’s what I don’t understand,” she said. When she visited the field she said there was “two inches of burned grounds”. Ms Granville said the incident left her “agitated and disturbed”. A number of theories have been put forward to explain the sightings. Then-MP for Pembroke, Nicholas Edwards contacted the Ministry of Defence after being “inundated” with UFO sightings. Flt Lt Cowan, an officer from RAF Brawdy, visited Ms Granville’s hotel and examined the site, but could find no evidence of a landing. In his report, he mentioned the possibility that a “local prankster was at work” and the description of aliens “fitted exactly the type of protection suit that would have been issued in the event of a fire at one of the local oil refineries”. This fits in with the account of businessman Glyn Edwards, who in 1996 revealed he wandered around the area in a silver suit in 1977 as a prank. The National Archives also released files which examined UFO sightings across Wales, and the officials who investigated the Broad Haven sightings suspected pranksters. “There is general speculation in the neighbourhood that a practical joker may be at work,” wrote staff at S4 – the government department that investigated sightings at the time. It was also thought school children could have confused a sewage tank as a UFO, although many were from farming backgrounds and would have been familiar with the machinery. More recently, a former US Navy sailor said the figure in a silver suit was in fact a member of US military personnel wearing their standard fireproof uniform and the UFOs were new Harrier jets flying over. To mark 40 years since the sightings, a conference is being held in Broad Haven on Saturday, organised by Swansea UFO Network. Organiser Emyln Williams said the case started “worldwide interest”. Asked if he thought it was genuine, he said: “One child can lie, but can a whole class? Mr Williams said there were several sightings the day the children claimed to have seen a UFO, including at Hubberston School in Milford Haven. “That year there was so much happening. It is what we know as a UFO flap,” he said. Eyewitness Mr Davies, who lives in Shropshire, will be a guest speaker. He said he had always been open-minded to the theories which attempted to explain the sightings and at no time had he “ever sensationalised his story”. “So many people are ridiculed for saying they have seen a UFO,” he said, describing his secondary school life as a “misery”. He admits UFOs has been a subject that has gone on to “dominate his life”. Attending alongside Mr Davies is Neil Spring, who wrote a book based on the Broad Haven sightings. “The moment I heard of this small village plagued by UFO sightings, I was inspired to understand what really happened,” he said. His research uncovered a secret investigation by the military police. “Whilst the government was telling the public they had no records of any unusual activity in the area, privately, officials were so concerned about the UFO sightings in Broad Haven that they asked the military police to conduct a ‘discreet’ investigation,” he said. Mr Spring believes local pranksters were behind some of the sightings, but said “people emulate what’s happening around them” and the pranks were inspired by events which had been “sincerely reported”. “My research showed that there were strange occurrences in Broad Haven long before the incident at the school and for a long times afterwards.